Unsure which product is the right one for you? Use the Synqion Assistant and let us make a recommendation! Do you need a license for yourself, or for a group of people? How many people do you need a license for? 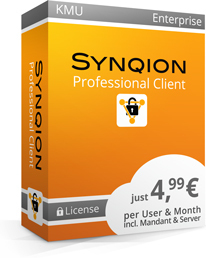 Would you like to store your data in the Synqion Cloud (the default), or do you require a private server? How many GB of storage space will you need (approximately)? Please contact us directly. Together with our sales team, we will set up the right solution for you. After the subscription has ended, the files stored in the attached depot will be deleted after a certain period. You will get another email notification before this happens. Granting of SEPA-mandate:* Ich ermächtige die SNAP Innovation Softwareentwicklungsgesellschaft mbH, Zahlungen von meinem Konto mittels Lastschrift einzuziehen. Zugleich weise ich mein Kreditinstitut an, die von SNAP Innovation Softwareentwicklungsgesellschaft mbH auf mein Konto gezogenen Lastschriften einzulösen. Hinweis: Ich kann innerhalb von acht Wochen, beginnend mit dem Belastungsdatum, die Erstattung des belasteten Betrages verlangen. Es gelten dabei die mit meinem Kreditinstitut vereinbarten Bedingungen. Omission of written/physical mandate:* I accept that there will be no physical SEPA-mandate sent to me. The user will receive an email prompting them to choose a password for their new user account. Note: to add an EXISTING user to an Account, that user must log in to the shop using their own Synqion username, go to ‘Settings’ -> ‘Account’ -> ‘Account’ -> ‘Join an Account’ and enter the Account number in the dialog. You still have unconfirmed changes. This Synqion Enterprise package is aimed at companies that wish to store data on their own premises. Consequently, the Enterprise Hosting Server is used for operations in the company's own computer center. The SME solution enables all data to be managed independently with minimal administrative input. In order to conveniently perform the administration of your users, you receive a tenant with a powerful hosted HTML-based management console. Integration into your directory services such as AD/LDAP, OAuth 2.0 is possible via the module for external authentication, which is supplied with the package. Should you have any questions on any of the offers or individual options, we will be pleased to assist you. Contact Synqion	.